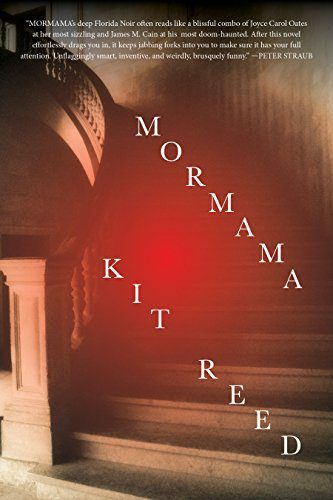 Mormama is Kit Reed's final book, as she sadly passed away last year; but what a book to leave as your final piece of work. Mormama is bold, smart and gripping from start to finish. That's not to say that Reed's approach to this book is an easy read—oh no, you aren't given an easy ride here. Reed assumes you can keep up and dives right into a jumbled-up timeline that is narrated from a myriad different perspectives. From the very first page, the novel makes you want to uncover the mystery of 553 May Street. The story is set in Jacksonville, Florida, where Reed's own mother grew up, and it's the house in which her mother lived that was the inspiration for the sprawling, gothic homestead that is at the centre of Mormama. We are first introduced to this world via Dell. Or at least that's what he calls himself—he is suffering from memory loss and doesn't in fact know who he is or where he comes from. All he has is a flash drive he dare not look at and an address—the aforementioned 553 May Street. Notice something about the house number? As is the tradition with creepy places (see Stephen King's 1408) the numbers add up to that most dreaded of all numbers: thirteen. If you weren't already aware you were stepping into trouble, you should be now. Dell has a feeling this is his home, but, unsure, he decides he is going to squat under the house until he can prove it. Here he immediately runs into Theo Hale, a young boy who, along with his mother, Lane, has just moved into the building as guests of Lane's three aunt's: Rosemary, Iris, and Ivy. They have had to come and live at 553 because Lane has split up from Theo's father—and now they don't have enough money for a place of their own. But there is someone else in the house: Mormama. A ghost? Maybe. A constant presence? Definitely. But who is she? It feels as if to explain this is something of a spoiler, but I'll say that she is a relative who knows what is going on in the house—and why it is a dangerous place for everyone to be. The story which ensues concerns, on the surface, Lane and Theo's attempts to get back on their feet and out of the house. But running alongside this we have the mysteries of Dell (who is he and why he is there? ), Mormama (why is her presence looming so large? ), the house (why does the house bring death to all men who live there? ), and finally—the aunts themselves. Why don't they want Lane and Theo to leave? Reed expertly weaves these various subplots throughout the book, drip-feeding her reader clues from the very first page. The constantly changing viewpoints can, at first, be a little disorientating, but you get used to them as Reed carves out distinct voices for each character. Most impressive is her characterisation of Theo, a young boy who never has that annoying “I'm an adult writing as a kid” voice (a trap too many authors fall into, especially as they get older). Theo sounds as if he could easily be a kid of today and that is the mark of a great—one who can adapt their style so it never becomes outdated. All this said, when you read or hear interviews with Reed you realise that Theo's voice is the one closest to her own: the author’s own youthful spirit comes through on every page of this novel … and, as such, Theo's sections are always the most fun to read. "...we don't let just anybody stay in Sister's room, but little Elena, you—"
..."Oh, Elena, you're just tired." "Elena was my mother." It breaks my heart, just hearing her name. I loved her so much! "Goddammit, I'm Lane! Mormama is never scary, or even creepy as the quotes on the back of the book claim, but it troubles and bothers the reader in a different way. You feel for each character as they desperately rail against their circumstances. Again, it's a testament to Reed's writing that even the worst characters ultimately come to deserve your sympathy. Mormama is a family drama with supernatural elements, but above all else it is desperately sad. In fact, the novel’s supernatural elements, while integral to the story, are overshadowed by the history of the Ellis family and the tragedies that lie within. If anything, this is a mystery novel that happens to have supernatural leanings, a horror of the domestic. If a criticism is to be made, it's that the ending seems to come too quickly and pick up the pace too jarringly. After the slow reveals and the general feeling of everyone being in a daze, the change of tone that comes in the last thirty pages or so, while exciting, seems like something has been cut that didn't need to be. The book wouldn't have felt overlong if it had built up to its final moments over twice that time. But this is a small criticism in what is a fantastic and emotional book. The reader leaves the novel discomfited, discombobulated. That effect is its primary goal, and it is fully realised. Considering her body of work, it is quite a feat that I had, I’m ashamed to admit, completely missed out on Reed before reading Mormama. I for one will be delving into her extensive back catalogue because of it. Mark Granger is trying to be a writer. His work has been used on BBC Radio 4 Extra and his short stories have been shortlisted in several competitions. His work can be found at mark-granger.tumblr.com. Although he barely updates it nowadays. One day he’ll get a proper website and stop referring to himself in the third person.